A Perseid meteor. Image credit and copyright: Pete Lawrence. Meteors, or shooting stars, are bright streaks of light originating from tiny grains of debris — often only the size of a grain of sand — whizzing through our atmosphere at speeds of tens of thousands of km per hour. Most of them originate from the trails of debris left by comets as they move around their orbits, and the Earth passes through the debris stream. In the case of the Perseid meteor shower that comet is Comet Swift-Tuttle, which passes close the the Earth and Sun every 133 years. It last made its closest approach in 1992, and won’t be back in the neighbourhood until 2126, but the trail of cometary debris remains. Observing meteors is one of the parts of astronomy that requires the least equipment— possibly none. Of course, you have to wait until the sky has got dark, which at this time of year is 9-10pm. Find somewhere with as little light pollution (street lights, house lights etc.) as possible, and with as wide a view of the sky as possible. Sit or lie back and just look up at the skies — don’t crane your neck as that gets uncomfortable. Give your eyes 20 minutes to adapt to the dark for the best results, and take a blanket or extra layers, as the nights can still get chilly. Meteors will appear randomly, but once you’re dark adapted you should see a meteor at least every few minutes, depending on your conditions — a more light polluted sky will mean that you only see the brightest ones. There’s a more in-depth guide on meteor observing from Paul Sutherland. While Perseid meteors can appear from late July until late August, they are more frequent in the middle of August, peaking on the nights of the 10th, 11th and 12th August. Meteors can appear anywhere in the sky, and there are also random, or “sporadic” meteors all year round, but if you trace their paths back, Perseids will appear to come from the constellation of Perseus (and typically appear longer the further away from the “radiant” they appear). The view should get better after midnight, as that’s when the part of the Earth you’re on is turned into the path of the meteors — and this year that is about when the moon sets as well, so the skies should get darker still. 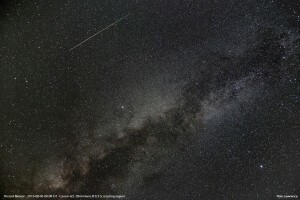 The Perseids also feature in the BBC Sky at Night summer starguide. Just remember, that every time you see a shooting star, it’s probably a tiny grain of space-dust that has been happily orbiting the Sun for billions of years, possibly as part of a comet for much of that time, but which no one took any notice of until the last split-second of its existence, as it encountered the upper reaches of the Earth’s atmosphere. The reason the Perseids are a particularly good shower is that the meteors are moving very fast relative to the Earth (about 58 km/s, or 130,000 mph), and so are typically very bright. The shower is also fairly consistent, thanks to the structure and location of the debris stream through which the Earth is passing. Some computer models suggest that this year’s shower will be better than normal, with more meteors and possible a few fireballs (very bright meteors), but such models are fairly complex and have been wrong in the past, so it will be interesting to see whether they’re right this year. If you’re really dedicated and would like to record meteors, then you can take long-exposure photos (maybe 30s to a few minutes) with a camera on a tripod, or you can record your visual observations, such as through the British Astronomical Association’s Meteor section.